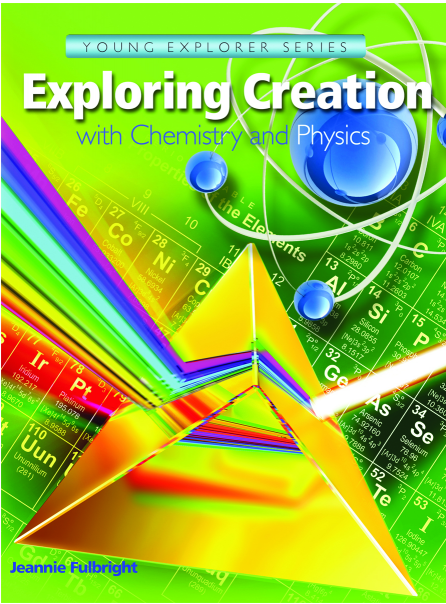 Apologia Educational Ministries has a new book available in their Young Explorer Series by Jeannie Fulbright called Exploring Creation with Chemistry and Physics. 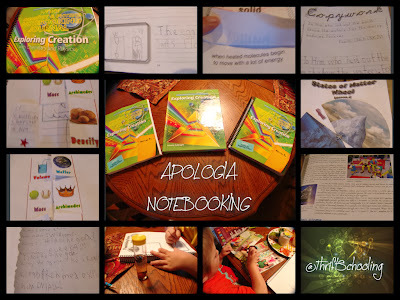 Using the Charlotte Mason approach, Apologia teaches science from a creationist perspective. This book includes 14 lessons that can be divided up in a way that best suits your need. We are currently using this course in our homeschool adapting the suggested daily schedule in a way that works for us. Their suggested schedule breaks the book up into 28 weeks, covering one lesson over a period of two weeks. They suggest using this book twice a week, but we spread it out and are doing it four times a week, sometimes five, depending on how many experiments there are! The textbook, believe it or not, can be used with children in grades K-6. I know that sounds like a wide age range, but it can be done! The material is presented in a way that even my kindergartner can understand the basic principles. Yet the vocabulary words are challenging enough for a sixth grader. Two type of notebooks can be purchased depending on the ages of your children. 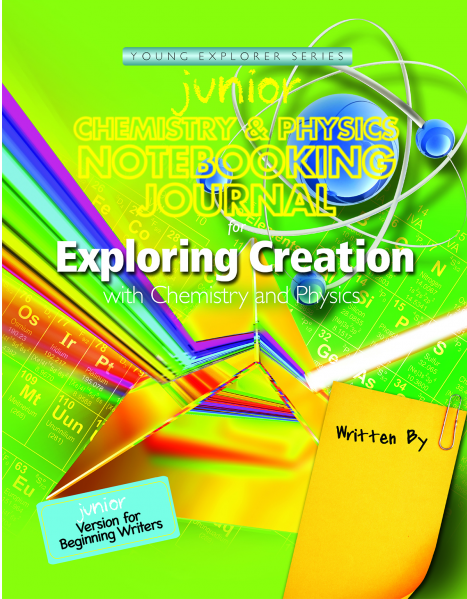 The Jr. Notebooking Journal (which I used for my Kindergartners and Second grader) has age appropriate activities such as coloring pages, crossword puzzles, full color mini- books, Bible verse copy work and many hands on experiments. The regular Notebooking Journal for older kids is meant for students who have mastered handwriting, can take notes and ready for upper elementary experiments. 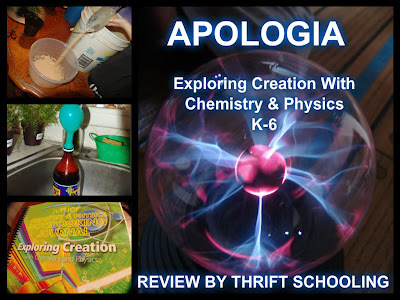 Apologia has changed the way we do science in our homeschool. Ever since day one, my children have loved science. 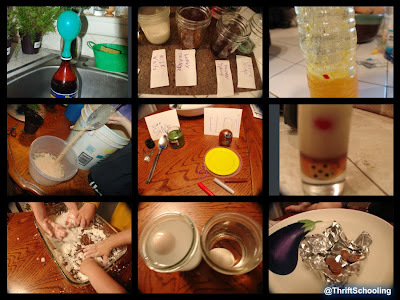 A majority of my teaching materials are science based. But just because I have tons of science experiment books doesn't mean it can be used as a complete curriculum, rather they are meant to be used as supplemental material. When the kids were really little I would simply go through the books, do the experiments and just have fun. There really wasn't much of a rhyme or reason to the experiments we did. It's just, they absolutely love the hands on aspect of experiments! Now that my two boys are in kindergarten and second grade, they are ready to dive deeper into the how's and why's of science. Now, I know that Chemistry and Physics may seem like quite advanced subjects for such little minds, but I thought I would give it a try and see how it would go! I had a friend look at the cover of the book and say, "wow, that looks like a college textbook! I actually do have to agree, and it may be intimidating for some parents at first glance, but, when you begin to use the book, the concepts truly are easy enough for even a kindergartner! The author speaks right to the student, making concepts such as density, buoyancy, and volume understandable. She uses everyday objects that a child can relate to such as bread, balls and Legos to explain scientific terms. There is quite the abundance of experiments in this book! Each chapter has several experiments recommended, we did almost all of them in the chapters we have covered, but you can pick and choose which ones would work for you! 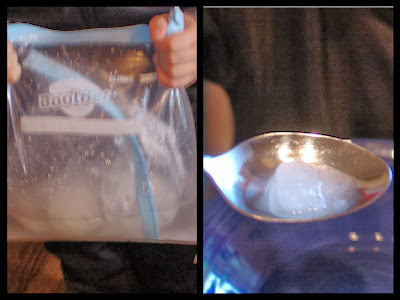 Most of the materials needed are everyday household items. What I have been doing, is each Saturday, I make a list of the materials that I need for the following week and pick them up when I go grocery shopping. 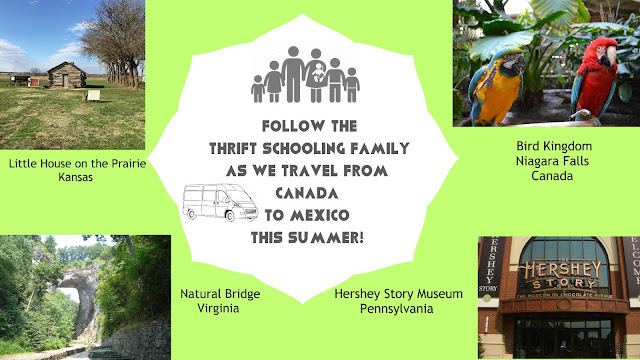 If it is easier for you, they have a list in the book of all the materials needed for each chapter, so you could by everything before the school year begins so you have it on hand! I like the variety of the activities. 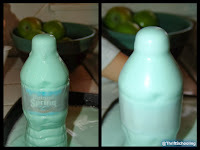 There is always something new for them to learn about in a tactile way! The pictures below show the children learning about the freezing point of water, and how the addition of salt can change it. And yes, this was one of the fun, edible experiments! In the Charlotte Mason method of teaching, both narration and notebooking are encouraged to facilitate retention. The way the book is set up, is there are breaks throughout the reading to allow for your child to dictate to you what they have learned. 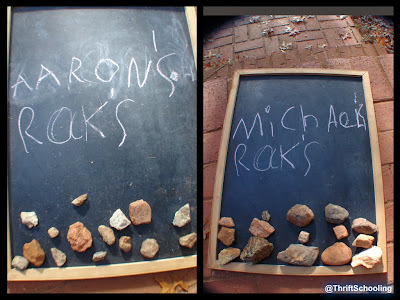 One of my children's favorite activities was "Archimedes Play." Learning about how to find density, the children are to write and perform a play about the ancient Greek mathematician, Archimedes. This allowed for creativity and movement and they were so excited to share about what they had learned with their father that evening when he came home! One thing that I have not yet embarked upon in our homeschooling is lapbooking. It's not that I'm entirely against it, I'm just don't have the desire to spend so much on printer ink for one project! Well, the notebooking activities that coincide with these lessons are an excellent alternative! You buy the notebook, which includes everything you need, similar to a lapbook. Not only does the junior notebook include coloring pages and copy work but full color flap books and activities. I definitely plan on using Apologia year after year in our homeschool! The notebooks keep the younger ones occupied and if they seemed to get restless during the reading, I would have them work on the coloring as I read. 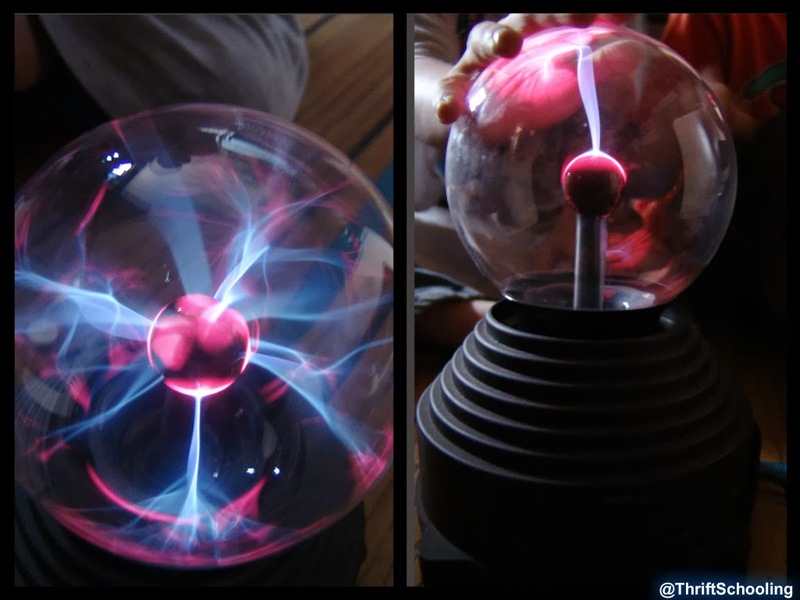 My kids received this plasma globe as gift and fit in perfectly when learning about electrical charge!